Very focused reviews examine the relevant options in rejuvenating the aging neck. Options in treating the aging neck include non-invasive, minimally invasive, and open surgical approaches. The geometry of the neck, as a simple yet non-hollow cylinder, is examined anatomically and through procedures specific to this unique area. Topical treatments for the aging skin, advances in non-invasive and minimally invasive technologies using various injectables and energy sources, and a range of open procedures that consider all of the internal components of the aging neck are presented. 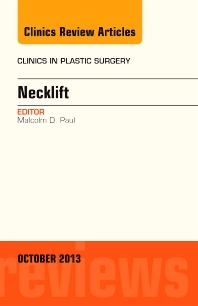 A special Techniques section poses questions to an international group of surgeons who respond with their preferred techniques and approaches and outcomes for such situations as defatting the heavy neck, approach to young versus older neck, use of fibrin glue, and more. Guest Editor Malcolm Paul, who works in academia, private practice, and with technologic companies, leads this review.